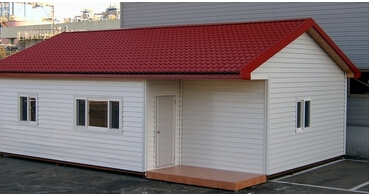 This roof and wall panel product line can manufacture many kinds of beautiful aspect wall and roof corrugated panels. The color and the profile is fashion and it is easy for you to construct buildings. Electric Elements PLC control panel, transducer imported from Mitsubishi of Japan. Coil Feeding Equipment Consists of one uncoiler with capacity of 5000kgs and its base. 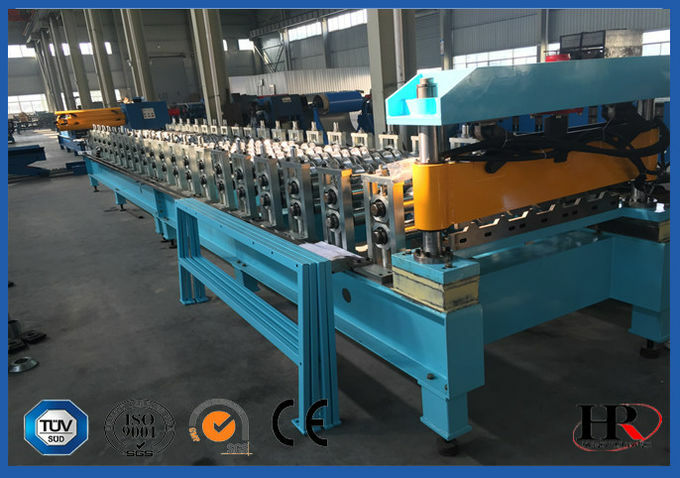 Guiding Equipment Adopting guiding bar and sliding block to control the width and position of the steel sheet. The coil is guided in the correct position and passed to the roll forming equipment. Mainframe Transmission Transfer the main motor power to the rollers through chains and sprockets, and also transfer the coil sheet. 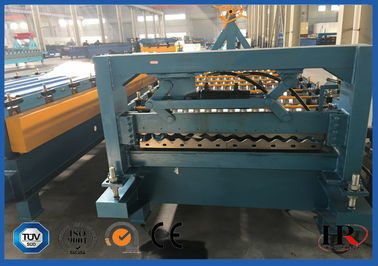 Roll forming system: The main frame of machine is welded separately and the outside wall is connected by screw after being rotoblasted on the surface. The rollers are surface-chromeplated after being machined by the exact machine tool. Post Cut Equipment The length and blocks can be set by the buyer through the control panel, when reach the set length, the machine will cut the panel automatically. The cutting is finished under the power of hydraulic station which guarantees the precision of cutting. Hydraulic Station Supplies the initial power to the cuter through a closed oil tank. It is off without cutting, which can save the power. PLC Control Panel The electric controlling system of this machine consists of five parts: Operating system, screen, PLC, transducer and strong electricity part. The controlling system of this machine are imported from Mitsubishi company of Japan. The system uses modularized structure and has convenient, reasonable, canonical wiring arrangement, and its maintenance is quite easy. Supporter Table To support the finished panels. The quantity we supply is 2 pieces with length 3000mm, it can support panels with 10000mm at normal condition. Roller material: No.45 steel with surface hard chrome painted.